Today's lesson is Samuel. I have combined the usual lesson of God Talking to Samuel with more about Eli and the loss of the Ark of the Covenant in a battle. As you can see below, I had the lesson on the floor on blankets and turned off the lights since it was nighttime. Samuel will lead us to David next week. Today's lesson is found in 1 Samuel 1-4. There was a man named Elkanah and he had 2 wives. One was named Peninnah and the other was Hannah. (1:2)They went to worship and sacrifice to God every year. 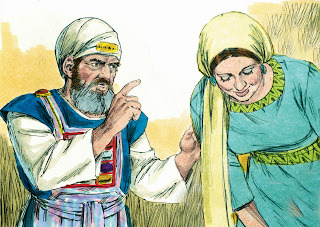 Elkanah loved Hannah, but she could not have any children, and Phinehas made her miserable because of it. So, every year when they went to worship, Hannah would cry and not eat. Eli the priest was sitting on the seat by the doorpost of the tabernacle. (1:9) Eli was watching Hannah as she cried and prayed for God to give her a baby boy. She told God that she would give the baby to God and wouldn't shave his head. 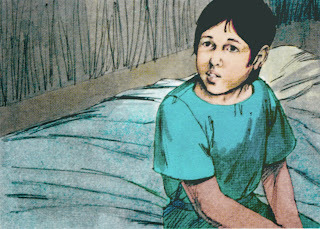 Eli saw Hannah praying and told her to go in peace, that the Lord would give Hannah her request. Hannah had a baby boy and she named him Samuel because “Because I have asked for him from the Lord.” (1:20) Hannah told Elkanah that she didn't want to go give sacrifices to God until Samuel was finished nursing (about 3 years according to research). When they did go to worship as a family, they took 3 bulls, flour & wine with them. 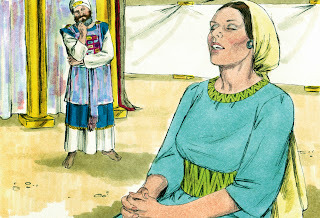 Elkanah & Hannah left Samuel at the temple to minister with Eli the priest. 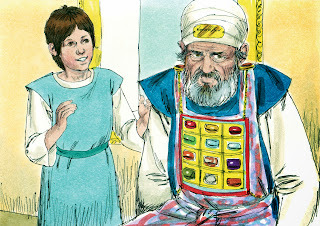 (2:11) Hannah would make Samuel a new robe when they visited every year. Hannah also had 3 more sons and 2 daughters. Eli told Samuel that he didn't call for him and to lay back down. This happened again, then the third time Eli realized that God must be talking to Samuel. Eli told Samuel to answer the Lord and say that His servant hears. The next time the voice said "Samuel! Samuel!" he answered. 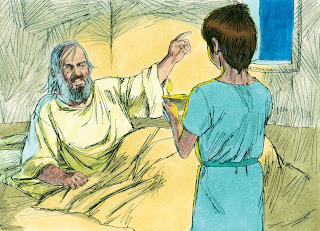 The Lord told Samuel that He was going to do something to Eli because of Eli's wicked sons. Eli knew what they were doing and he didn't stop them. 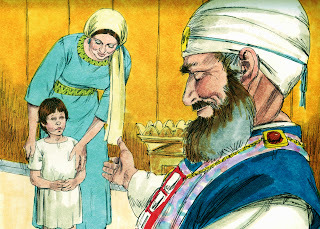 Samuel grew up and everyone knew that he was a prophet from the Lord. Israel lost a battle to the Philistines. About 4,000 men were killed. They wondered why they lost the battle and decided to take the ark of the covenant from Shiloh and bring it to their camp. Maybe it would help save them from their enemies. Eli's two bad sons were there. When the ark of the covenant came into camp, they shouted so loud the ground shook! (4:5) The Philistines wondered what was going on! And, they worried that they would have to fight God! But, they shouted to fight! And, the Philistine's won the battle. There was a huge slaughter with 30,000 foot soldiers killed. 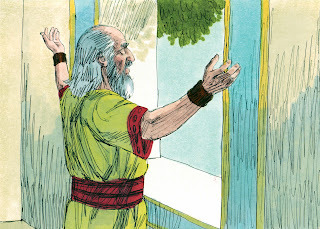 Samuel became judge to Israel. He was a good judge and turned the people back to God. (Chap. 7) We will continue with Samuel next week as we talk about David. For today's activity, I decided to lay a blanket on the floor, and sit on the floor to do the lesson. 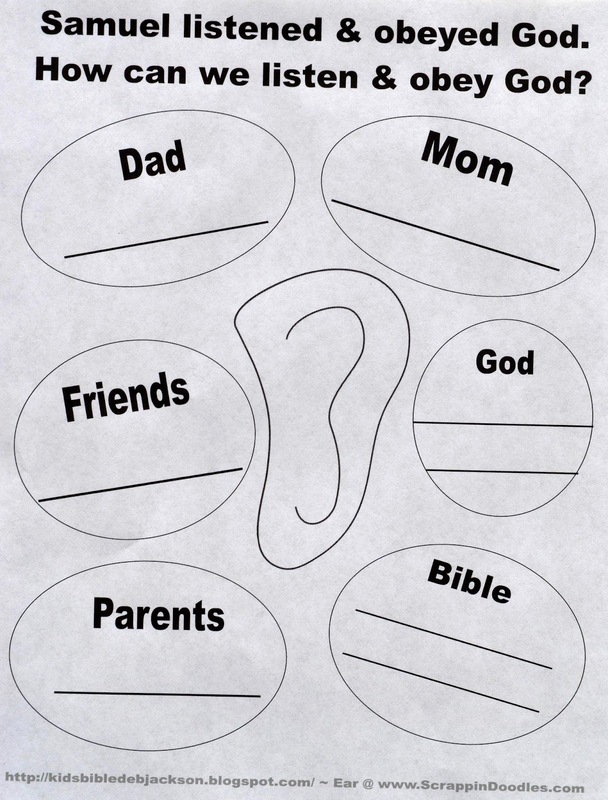 First we talked about if God called to them, what would they do, think, how would they answer. Does God talk directly to us today? We have the Bible. Can we talk to God? Yes, in prayer. We looked at the following question sheet and discussed things we can do to listen and obey the various people listed. 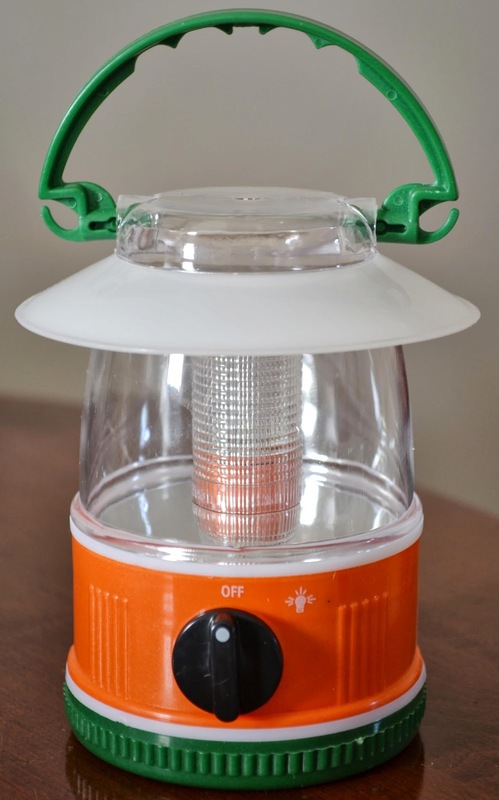 I started the lesson and turned off the lights and said "Samuel, ..." I used this lantern to have Samuel answer Eli. We continued the lesson on the floor, then moved to the table to finish worksheets, etc. You can print the above question sheet here. Click here to see all the worksheets for this quarter. Great lesson! Thanks for sharing with Afterschool! Thank you! Thanks so much for pinning and sharing! Hi, I love your work. One request, it is cumbersome to have to click on each sheet, is it possible that you could have the entire lesson on one link? At this time, I do not have time to change how I add things to each post. I am not sure what exactly you are asking, but the visuals are from another site and I do not control how they have them, also, I feel it only fair for people to support them and go to their site to download the free pictures. Thanks for stopping by, though! 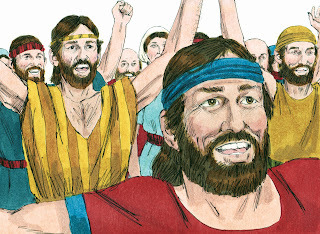 This is a great resource for teaching about Samuel. Thanks for hosting! Thanks for the nice comment! Glad you stopped by! Good lesson! You might want to correct Elkanah's wife. 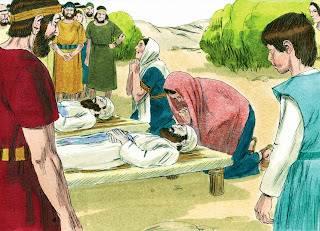 Phinehas was Eli's son. 1 Samuel 1: 2, 3-- "And he had two wives; the name of the one was Hannah, and the name of the other Peninnah. And this man went up out of his city yearly to worship and to sacrifice unto the LORD of hosts in Shiloh. And the two sons of Eli, Hophni and Phinehas ... "
wwow it must be an awesome resource! thanks so much!